It might be ugly and outdated. It might even be marred by scratches, cracks, knife marks and burns. But if you think your countertop is in such bad shape that the only option is replacement, you might want to think again. Miracle Method technicians have refinished hundreds of kitchen and bathroom surfaces over the years. Through our advanced refinishing process, we have saved homeowners thousands of dollars in replacement costs. We’ve found that opting to resurface your countertop, rather than refinishing it, will typically save homeowners 30% to 50% over total demolition and replacement costs. 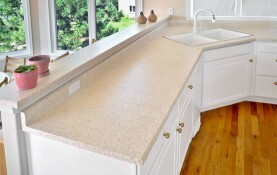 Don't replace your countertops... Let Miracle Method refinishg them! While countertop refinishing has been popular for years, only recently have technological advances made the process more durable, affordable effective and attractive to homeowners. The Miracle Method process involves cleaning and sanding the counters, and then then applying a hard, durable and advanced acrylic coating and a proprietary MM-4 bonding agent. Our refinishing process is so effective that it can extend the life of your surface for up to 15 years. We can refinish bathroom vanities, cultured marble sink vanities and including Corian, Formica, and Wilsonart laminate breakfast bars and counters. We can also add a bull nose edge. Another great thing about our process: our countertop finishes are stain resistant and available in dozens of colors and textures. Our beautiful stone look finishes are also very popular. All in all, our process only takes about two days to finish and is not nearly as messy as replacing the countertops. In fact replacing a countertop can take anywhere from a week to several months, depending on the type of countertop you want. Refinishing is a great option for people who have very unique, or custom counters or surfaces that would be hard to replace or extremely difficult to replace. 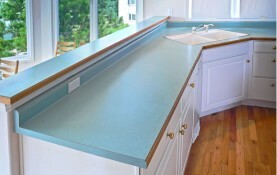 Do you have additional questions about countertop resurfacing? Visit our FAQ page.